Posted on March 28, 2019 in Insights by Carlin Leung. It’s common knowledge in business that it’s a good idea to keep an eye on the competition. Sound competitive analyses help you understand your company’s advantages and play a key role in determining your business strategy. A content marketing competitive analysis is no different—keeping tabs on your competitors can be the difference between an excellent or ineffective content strategy. That said, information about the competition isn’t always easy to come by. What sources should you be mining? What exactly should you be looking for? And most importantly, what should you do with the information once you’ve found it? We’ll explore these questions below, but first, you’ll need to determine who your competitors actually are. When thinking of competitors, it’s natural to think of business competitors—the companies that target the same set of consumers for a slice of market share, and ultimately, dollars. For example, Canadian outdoor retailer MEC might flag retailers such as Mountain Hardwear, Patagonia, or even Amazon as their competition, as customers looking to buy outdoor equipment will need to choose between these retailers when spending their money. It’s important to keep business competitors in mind, but when conducting a content marketing competitive analysis, you’ll need to identify content competitors—the companies whose content vies with yours for attention. Often, content competitors will not only include business competitors who publish content, but also magazines, blogs, and other publications. Continuing our above example, MEC’s content strategy is focused heavily on outdoor adventure and travel, which means that their content competitors could range from Outside Online to REI’s blog. The topics or subject areas they’re creating content about. Are they more focused on products, industry trends, or something else altogether? The formats of content they’re publishing. Do they tend to create more videos, blog posts, or infographics? To get this data, you’ll first need a list of the content produced by each competitor. This can be done manually by visiting each competitor’s blog or content site and taking note of what’s been published, or by viewing a competitors’ sitemap (often located at www.example.com/sitemap.xml). Alternatively, you can use Google’s site search operator to surface a list of all the content indexed by Google on a single site. 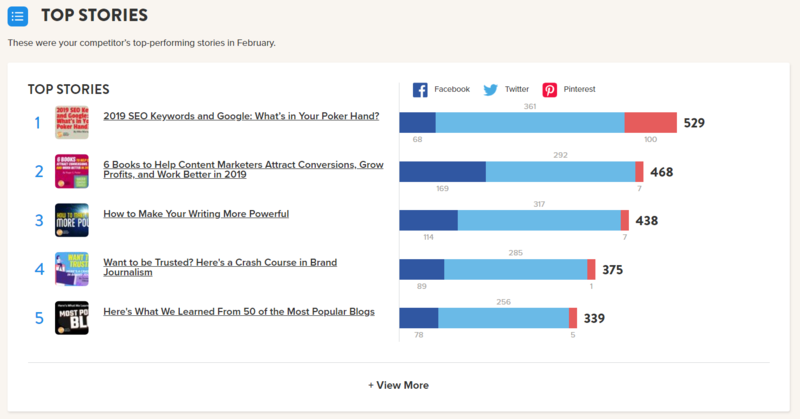 After you’ve compiled your list, skim each headline to get a sense of what topics are most common for each competitor. Headlines may also provide a good idea of the format of each piece of content—for example, many infographic posts will include the word “infographic” in the headline. If you have time, creating a spreadsheet to log the key topics and format for each of your competitor’s posts will make sure you avoid any bias. Admittedly, this process can be time-consuming. If you’re in a hurry, you can do a visual sweep of headlines to get a gut sense of the material. Or better yet, Quietly Insights can automatically analyze all your competitors’ posts, then identify the most popular topics for each company or brand. If you’re feeling ambitious, you can gather more information, such as the voice and tone and the typical length or structure of each competitor’s content. But these more subtle data points are tougher to collect—just gaining an understanding of the topics and formats that are preferred by your competitors is a great start. If you want help with a deeper competitive analysis, we’d love to help. Your roundup of topics can show you where your competitors have likely experimented with their content and where they’ve focused as a result. Taking note of their learnings can save you a lot of time. However, this strategy isn’t foolproof—what if your competitors aren’t going down the right path, or haven’t tested extensively? To verify which topics and formats are truly effective in your industry, you first need to determine what success looks like. Due to the limited amount of data that can easily be collected from competitors, measuring a competitor’s performance typically falls into two buckets: SEO performance, and social performance. Pages that are ranking for keywords with an average position of 3 or higher. These keywords can give you insight into what topics are most effective for your competitors. 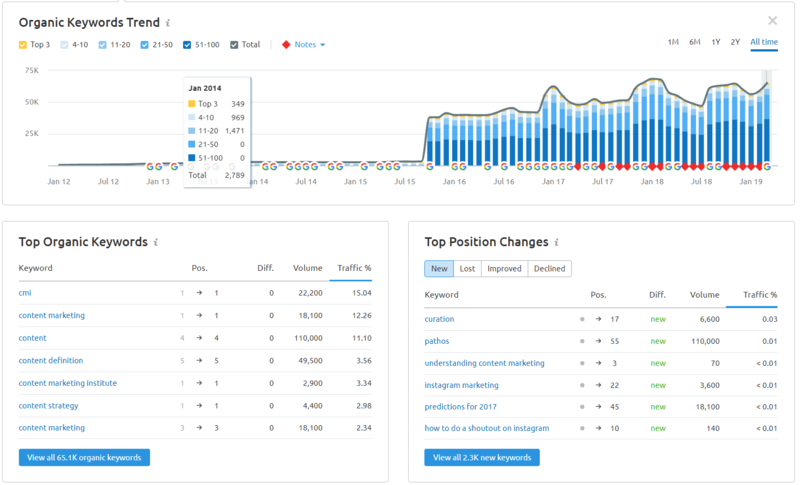 It’s likely that it will be difficult to overtake your competitors in these keywords, especially if these keywords have a high keyword difficulty. Pages that are ranking for keywords with an average position of 11 or lower. If these keywords have a low keyword difficulty, it’s likely that they are of lesser importance to your competitors, leaving you an opening to compete more easily. The topics that have the highest average engagements. These are the topics that readers are most likely to share, and can serve as a good measure of reader interest. 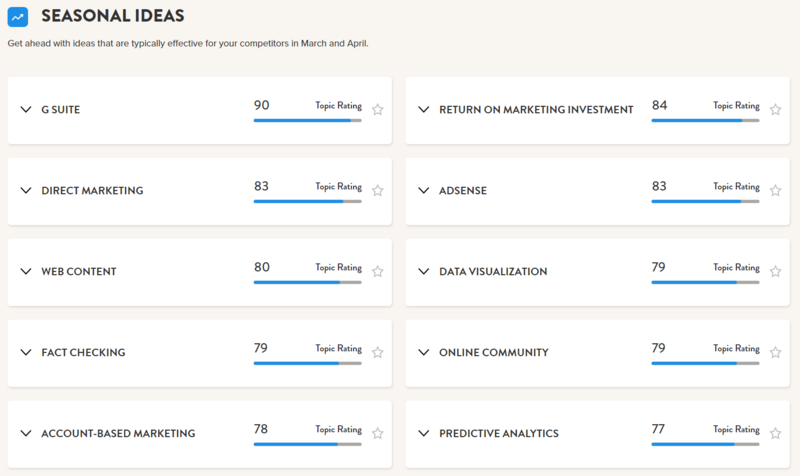 Quietly Insights automatically identifies your key topics by engagements—for example, ours are “marketing calls to action”, “keyword research”, and “marketing management”. The formats that have the highest average engagement. Aside from topics, the way in which content is presented is often an important factor for content performance. Understanding the formats that most excite your readers can help you prioritize your content efforts. Aside from looking at examining topics and formats, identifying the lengths, styles, or tones of content most likely to perform can also help you better understand your target audience’s preferences. Before we move on, there are two more important tips to keep in mind when it comes to competitive analysis. Evaluate all content, not just top performers. It’s easy to assume a common topic among a competitor’s top stories is highly effective. However, it’s possible that there are many more underperforming stories about that exact same topic. Looking at all content ensures you get the full picture. Look for what your competitors don’t talk about. While browsing through your competitors’ content, it’s just as important to identify the relevant topics that aren’t covered. These “white spaces”—topics that are overlooked by the competition—can often be quick wins to get your content ahead of the pack. Content marketing competitive analysis made easy with Quietly Insights. Once you’ve identified the white spaces in your competitive landscape—topics not discussed, formats not used, or keywords not optimized by your competitors—create content to fill the gap. By taking advantage of the open real estate in the landscape, you have the opportunity to set the standard and own the space. Before jumping into the deep end, though, it’s important to consider why competitors may have avoided these specific topics, formats, or keywords. Be sure to do some research to see whether there is a reason to avoid this space—some keywords may have alternate meanings that are more closely associated with another industry, and some topics may be particularly difficult to research. If it appears that the space has simply been overlooked or ignored, you have the opportunity to add your unique perspective into the mix. It may seem obvious, but it’s important to remember to actually apply the information you surface in your research. After a thorough analysis, you should have a strong understanding of your competitors’ strengths and weaknesses. Mainly, this means crafting high-quality content to overtake your competitors where they see the least success and therefore face a lower barrier to entry. Where your competitors are strongest, identify best practices, and build upon their success—try using tactics like the skyscraper technique to further elevate the conversation. Finally, use your analysis to uncover where you fit in the market. No matter how well you think your content is performing, it helps to understand the wider context of your industry before continuing or adjusting your strategy. You’ll also get a sense of whether you need to invest more into content to really make a mark. Comparing your performance against your competitors also forces you to think critically about why certain topics, formats, or ideas work for competitors. Remember, just because something is effective for the competition, it doesn’t mean that it will necessarily work for you. It’s important to reflect on your past performance and your content goals to determine whether that white-space opportunity or competitor weakness is the direction you want to take your content strategy. A thorough competitive analysis is crucial for your content strategy, and should be completed on a quarterly or semi-annual basis. This ensures that you’re always up to date on your industry, and aren’t unknowingly falling behind the competition. While this can be time-consuming, tools like Quietly Insights can handle a significant part of the work. Get started today for free, or send any questions you might have to the strategy team at Quietly.